The death of Henry VIII and the accession to the throne of his young son Edward in 1547 made possible a number of liturgical changes in the Church of England, of which this was one of the first. It was made necessary by the passing in both Parliament and Convocation a requirement that communion be administered under both kinds - wine in addition to the traditional bread. This meant changes in the liturgy would be required, and this Order was the result. 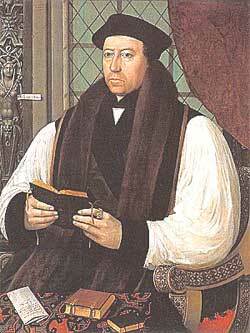 As with the first Book of Common Prayer of 1549, it is not known who the author or authors were, but it is widely assumed to be largely the work of Archbishop Thomas Cranmer (pictured below). One will quickly notice that the service is incomplete; it was actually intended as an English insert into the Latin Mass. Thus it only includes those parts of the mass which it was thought that the people ought to hear and understand - for example, exhortations, the confession, and the words of administration. Having the mass entirely in English was thought to be sufficiently innovative that it would be wise not to do it all at once. Thus this was the interim Communion Service for about 15 months until the complete Prayer Book of 1549 was published. Nevertheless, it is immediately apparent that much of the language of this Rite has survived in the liturgy down to the present day. The text was taken from a reprint in The First Book of Common Prayer and The Ordinal of 1549 together with The Order of the Communion, 1548, by HB Walton & PG Medd, published by Rivingtons in 1869. Their source, in turn, was an original in the Bodleian Library, with comparison to other copies (different printings of this work exhibit a number of minor differences). This has also been compared with an earlier reprint, The Two Liturgies ... with other Documents as set forth by Authority in the Reign of King Edward VI, J Kelty, ed., Cambridge Univ. Press for the Parker Society, 1844, to which it agrees, except as noted. As may be seen from comparison with the picture below, both reprints have updated language and spelling. Google Books has online The Order of the Comunion 1548, published by the Henry Bradshaw Society in 1908. This book contains a thorough introduction, a photographic facsimile of the original text, contemporary Latin and German translations, and the Order as it would have been used, i. e., the Sarum Rite with the Order of Communion inserted into it. It is also available from the Internet Archive. The German translation is also available online from the Bayerischen Staatsbibliothek and as a transcription. EDWARD by the grace of God king of England, France, and Ireland, defender of the faith, and of the Church of England and Ireland in earth the supreme head: to all and singular our loving subjects, greeting. Forsomuch as in our High Court of Parliament lately holden at Westminster, it was by us, with the consent of the lords spiritual and temporal and Commons there assembled, most godly and agreeably to Christ's holy institution enacted that the most blessed Sacrament if the Body and Blood of our Saviour Christ should from henceforth be commonly delivered and ministered unto all persons within our Realm of England and Ireland, and other our dominions, under both kinds, that is to say, of Bread and Wine, (except necessity other ways require,) lest every man phantasyng [fantasizing] and devising a sundry way by himself, in the use of this most blessed Sacrament of unity, there might thereby arise any unseemly and ungodly diversity: Our pleasure is, by the advice of our most dear uncle the duke of Somerset, governor of our person, and Protector of all our Realms, dominions, and subjects, and other of our Privy Council, that the said blessed Sacrament be ministered unto our people only after such form and manner as hereafter, by our authority, with the advice before mentioned, is set forth and declared: willing every man, with due reverence and Christian behaviour to come to this holy Sacrament and most blessed Communion, lest that by the unworthy receiving of so high mysteries they become guilty of the Body and Blood of the Lord, and se eat and drink their own damnation; but rather diligently trying themselves, that they may so come to this holy Table of Christ, and so be partakers of this holy Communion, that they may dwell in Christ, and have Christ dwelling in them. And also with such obedience and conformity to receive this our ordinance, and most godly direction, that we may be encouraged from time to time further to travail for the reformation, and setting forth of such godly orders, as may be most to God's glory, the edifying of our subjects, and for the advancement of true religion. Which thing we (by the help of God) most earnestly entend to bring to effect, willing all our loving subjects in the mean time to stay and quiet themselves with this our direction, as men content to follow authority, (according to the bounden duty of subjects), and not enterprising to run afore, and so by their rashness become the greatest hinderers of such things as they more arrogantly than godly would seem (by their own private authority) most hotly to set forward. We would not have our subjects so much to mislike our judgment, se much to mistrust our zeal, as though we either could not discern what were to be done, or would not do all things in due time. God be praised, we know both what by his word is meet to be redressed, and have an earnest mind, by the advice of our most dear uncle, and other of our Privy Council, with ail diligence and convenient speed so to set forth the same, as it may most stand with God's glory, and edifying and quietness of our people: which we doubt not but all our obedient and loving subjects will quietly and reverently tarry for. The Order of the Communion. First, the Parson, Vicar, or Curate, the next Sunday or Holy­day, or at the least one day before he shall minister the Communion, shall give warning to his Parishioners, or those which be present, that they prepare themselves thereto, saying to them openly and plainly as hereafter followeth, or such like. First, That you be truly repentant of your former evil life, and that you confess with an unfeigned heart to Almighty God your sins and unkindness towards his Majesty, committed either by will, word, or deed, infirmity or ignorance; and that with inward sorrow and tears you bewail your offences, and require of Almighty God mercy and pardon, promising to him, from the bottom of your hearts, the amendment of your former life. And amonges all others, I am commanded of God especially to move and exhort you to reconcile yourselves to your neighbours whom you have offended, or who hath offended you, putting out of your hearts all hatred and malice against them, and to be in love and charity with all the world, and to forgive other, as you would that God should forgive you. And if there be any of you whose conscience is troubled and grieved in any thing, lacking comfort or counsel, let him come to me, or to some other discreet and learned Priest taught in the law of God, and confess and open his sin and grief secretly; that he may receive such ghostly counsel, advice, and comfort, that his conscience may be relieved, and that of us, as a Minister of God, and of the Church, he may receive comfort and Absolution, to the satisfaction of his mind, and avoiding of all scruple and doubtfulness: requiring such as shall be satisfied with a general Confession not to be offended with them that doth use, to their further satisfying, the auricular and secret Confession to the Priest; nor those also, which think needful or convenient, for the quietness of their own consciences, particularly to open their sins to the Priest, to be offended with them which are satisfied with their humble confession to God, and the general Confession to the Church; but in all these things to follow and keep the rule of charity; and every man to be satisfied with his own conscience, not judging other men's minds or acts, where as he hath no warrant of God's Word for the same. The photo at left shows a portion of the original text containing the rubric (printed immediately below) which specifies the administration of both wine and bread. ¶ The time of the Communion shall be immediately after that the Priest himself hath received the Sacrament, without the varying of any other rite or ceremony in the Mass, (until other order shall be provided,) but as heretofore usually the Priest hath done with the Sacrament of the Body, to prepare, bless, and consecrate so much as will serve the people; so it shall yet continue still after the same manner and form, save that he shall bless and consecrate the biggest Chalice or some fair and convenient Cup or Cups full of Wine, with some Water put unto it. And that day not drink it up all himself, but taking one only sup or draught, leave the rest upon the Altar covered, and turn to them that are disposed to be partakers of the Communion, and shall thus exhort them as followeth. DEARLY beloved in the Lord, ye, coming to this holy Communion, must consider what S. Paul writeth to the Corinthians, how be exhorteth all persons diligently to try and examine themselves, or ever they presume to eat of this Bread and drink of this Cup. For as the benefit is great, if with a truly penitent heart and lively faith we receive this holy Sacrament; (for then we spiritually eat the Flesh of Christ, and drink his Blood; then we dwell in Christ, and Christ in us; we be made one with Christ, and Christ with us): So is the danger great, if we receive the same unworthily; for then we become guilty of the Body and Blood of Christ our Saviour; we eat and drink our own damnation, because we make no difference of the Lord's Body; we kindle God's wrath over us; we provoke him to plague us with divers diseases, and sundry kinds of death. Judge therefore yourselves (brethren), that ye be not judged of the Lord; let your mind be without desire to sin; repent you truly for your sins past; have an earnest and lively faith in Christ our Saviour; be in perfect charity with all men; so shall ye be meet partakers of these holy Mysteries. But above all things you must give most humble and hearty thanks to God, the Father, the Son, and the Holy Ghost, for the redemption of the world by the Death and Passion of our Saviour Christ, both God and Man; who did humble himself, even to the death upon the Cross, for us miserable sinners, lying in darkness and the shadow of death; that he might make us the children of God, and exalt us to everlasting Life. And to the end that we alway should remember the exceeding love of our Master and only Saviour Jesus Christ, thus doing for us, and the innumerable benefits which by his precious blood-shedding he hath obtained to us; he hath left in these holy Mysteries, as a pledge of his love, and a continual remembrance of the same, his own blessed Body and precious Blood, for us spiritually to feed upon, to our endless comfort and consolation. To him therefore, with the Father and the Holy Ghost, let us give, as we are most bound, continual thanks; submitting ourselves wholly to his holy will and pleasure, and studying to serve him in true holiness and righteousness all the days of our life. Amen. IF any man here be an open blasphemer, advouterer [adulterer], in malice, or envy, or any other notable crime, and be not truly sorry therefore, and earnestly minded to leave the same vices, or that doth not trust himself to be reconciled to Almighty God, and in charity with all the world, let him yet a while bewail his sins, and not come to this holy Table, lest, after the taking of this most blessed Bread, the devil enter into him, as he did into Judas, to fulfil in him all iniquity, and to bring him to destruction, both of body and soul. ¶ Here the Priest shall pause a while, to see if any man will withdraw himself : and if he perceive any so to do, then let him common with him privily at convenient leisure, and see whether he can with good exhortation bring him to grace. And after a little pause, the Priest shall say. You that do truly and earnestly repent you of your sins and offences committed to Almighty God, and be in love and charity with your neighbours, and intend to lead a new life, and heartily to follow the commandments of God, and to walk from henceforth in his holy ways; draw near, and take this holy Sacrament to your comfort, make your humble Confession to Almighty God, and to his holy Church, here gathered together in his Name, meekly kneeling upon your knees. Then shall a general Confession be made, in the name of all those that are minded to receive the holy Communion, either by one of them, or else by one of the Ministers, or by the Priest himself; all kneeling humbly upon their knees. ALMIGHTY God, Father of our Lord Jesus Christ, Maker of all things, Judge of all men; We knowledge and bewail our manifold sins and wickedness, which we, from time to time, most grievously have committed by thought, word, and deed, against thy divine Majesty, provoking most justly thy wrath and indignation against us. We do earnestly repent, and be heartily sorry for these our misdoings; the remembrance of them is grievous unto us; the burthen of them is intolerable. Have mercy upon us, have mercy upon us, most merciful Father; for thy Son our Lord Jesus Christ's sake forgive us all that is past; and grant that we may ever hereafter serve and please thee in newness of life, to the honour and glory of thy Name; through Jesus Christ our Lord. OUR blessed Lord, who hath left power to his Church to absolve penitent sinners from their sins, and to restore to the grace of the heavenly Father such as truly believe in Christ; Have mercy upon you; pardon and deliver you from all sins; confirm and, strength you in all goodness; and bring you to everlasting life. Hear what comfortable words our Saviour Christ saith to all that truly turn to him. COME unto me all that travail and be heavy leaden, and I shall refresh you. So God loved the world, that he gave his only-begotten Son, to the end that all that believe in him should not perish, but have life everlasting. Hear also what S. Paul saith. This is a true saying, and worthy of all men to be embraced and received, That Jesus Christ came into this world to save sinners. Hear also what S. John saith. If any man sin, we have an Advocate with the Father, Jesus Christ the righteous: he it is that obtained grace for our sins. ¶ Then shall the Priest rise, the people still reverently kneeling, and the Priest shall deliver the Communion first to the Ministers, if any be there present, that they may be ready to help the Priest, and after to the other. And when he doth deliver the Sacrament of the Body of Christ, he shall say to every one these words following. THE Body of our Lord Jesus Christ which was given for thee, preserve thy body unto* everlasting life. ¶ And the Priest, delivering the Sacrament of the Blood, and giving every one to drink once and no more, shall say. THE Blood of our Lord Jesus Christ which was shed for thee, preserve thy soul unto everlasting life. ¶ If there be a Deacon, or other Priest, then shall he follow with the Chalice; and as the Priest ministereth the Bread, so shall he, for more expedition, minister the Wine, in form before written. THE peace of God, which passeth all understanding, keep your hearts and minds in the knowledge and love of God, and of* his Son Jesus Christ our Lord. ¶ Note, that the Bread that shall be consecrated shall be such as heretofore hath been accustomed. And every of the said consecrated Breads shall be broken in two pieces, at the least, or more, by the discretion of the Minister, and so distributed. And men must not think less to be received in part than in the whole, but in each of them the whole Body of our Saviour Jesu Christ. ¶ Note, that if it doth so chance that the Wine hallowed and consecrate doth not suffice or be enough for them that do take the Communion, the Priest, after the first Cup or Chalice be emptied, may go again to the Altar, and reverently and devoutly prepare and consecrate another, and so the third, or more likewise, beginning at these words, Simili modo postquam conatum est, and ending at these words, Qui pro vobis et pro multis effundetur in remissionem peccatorum, and without any levation or lifting up*. ¶ Imprinted at London, the .viii.